How we assembled a RISC-V desktop computer. 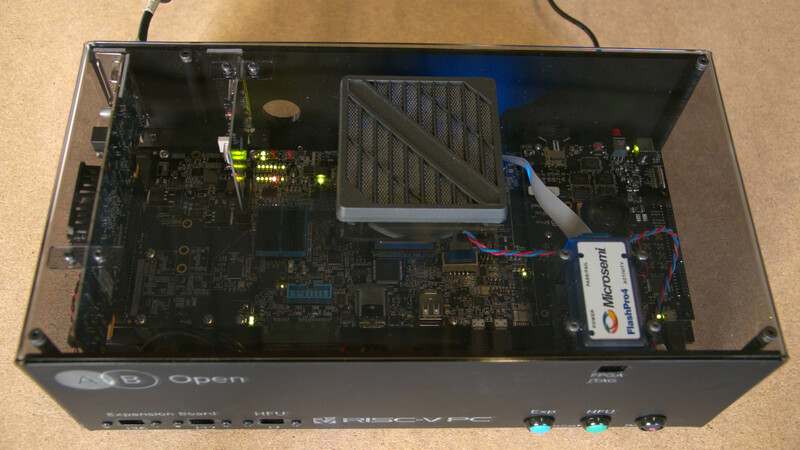 The HiFive Unleashed has a companion Expansion Board from Microsemi which features a mating connector, Polarfire FPGA and a bunch of peripheral I/O. 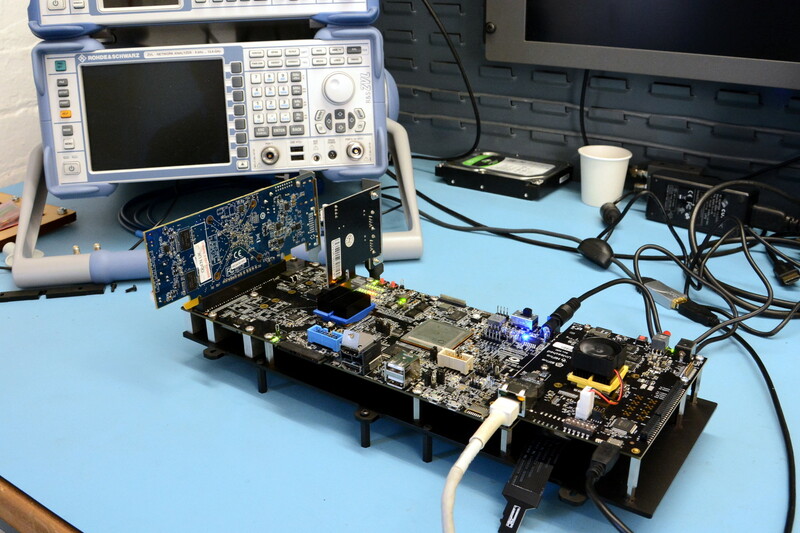 At the time of writing a bitstream is provided for configuring the FPGA to implement a ChipLink interface towards the RISC-V processor and a PCIe root complex, which is in turn connected to a PCIe switch ASIC. There is one 16x connector, another 1x and an M.2 slot, for a total of three PCIe slots. The Expansion Board also has a SATA interface that can be used right now, along with HDMI and USB connectors which could potentially be used with a new FPGA bitstream. The quickest way to complete our PC was to simply add a PCIe USB 3.0 controller and a graphics card which had open source drivers. We decided to fit both M.2 PCIe NVMe and SATA SSD storage for good measure. Of course, rather cool hardware such as this deserves a smart case to protect it and create something that looks more like a desktop computer. With this in mind we made a custom enclosure out of laser cut acrylic, with connectors and extension cables so that we could access the ports, and a clear lid so that we could easily check status LEDs. To find out more about the build see the video. Some expressed surprise over in comments on Hacker News that this “just worked” and we would like to note that, as also pointed out in the comments, this is thanks to a cast of many at SiFive, Microsemi, Fedora, Debian and Western Digital, who did all the hard work. 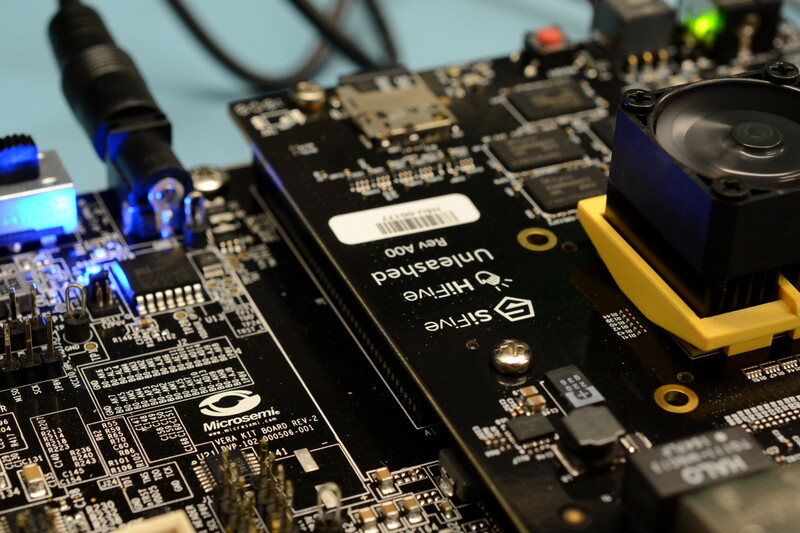 Making a chip such as the SiFive Freedom U540 is certainly no small feat, but the Microsemi Expansion Board is a pretty hefty hardware design also and then you have ChipLink and a PCIe root complex in the FPGA. Next you need bootloaders and Linux kernel support, which means compiler, libc and debugger ports. There are many moving parts and a ton of work that has to be done by compiler engineers and kernel hackers etc. to get a Linux kernel to boot with access to peripherals. Then the Linux distros have to get to work configuring, patching, testing and packaging etc. That this just worked is a testament to all the hard work which meant that we could simply assemble a collection of parts, follow an installation guide and end up with a functioning RISC-V PC. That this enabling work could be completed in such a timeframe, with the sheer complexity and numerous stakeholders involved, is a testament to open source development.